Tracing all That Remains of the Village of Bayt Tima. Bayt Tima is located in the middle of Gaza District, south of al-Majdal, east of al-Jiyya, as shown on the map. There are no Israeli settlements on Bayt Tima village lands. Sycamore and carob trees grow around the rubble on the site. 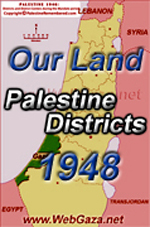 This entry was posted in Palestine 1948 and tagged Bayt Tima. Bookmark the permalink.